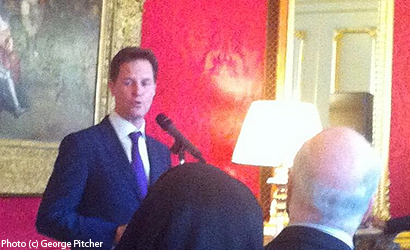 It looks like Deputy Prime Ministers don’t get first pick of diary dates as Nick Clegg has had to wait until after Easter this year to have his Easter reception for Christian Leaders and school children, which took place earlier today at Lancaster House. Despite having no faith himself and the main focus apparently being an Easter egg hunt, Clegg has still done a decent job commenting on a couple of key themes from recent days and in particular denouncing those who question and try to distort the motives of Christians who give their own time and energy running foodbanks. Hello everybody, thank you so much, can – where are the all the boys and girls in the other room? Do they want to come in? Right, right, I know they want their Easter eggs, that comes later, but – look, it’s lovely to see you, thank you very, very much for being here at this Easter reception. I’m not going to seek to compete with the Prime Minister, either for controversy or evangelism when it comes to Easter receptions, but I do want to give you the very, very warmest of welcomes here at Lancaster House. It really is lovely to see you. I am not a man of faith myself; almost all of my family and family members are, however, so I spend a lot of time, like people both of faith and not of faith listening to and contemplating and thinking about the Easter message. And I have to say, it strikes me – and I know it strikes millions and millions of people, whether they are Christians or non‑Christians, whether they are believers or non‑believers, that there is something extraordinarily and uniquely moving about the Easter message and the Easter story. I think it is impossible to imagine something which has a more extraordinary mix of suffering, of forgiveness and above all, of love woven into it as a message and that’s certainly something which was driven home to me and I know to my children and my family, as we listen to and experience the Easter message again this weekend, as everybody does year in, year out. So, yes, a few days late, but nonetheless a warmest welcome for being here. There’s been, I think, a really interesting debate actually, over the last few days in the context of this year’s Easter about whether we are, or are we not, a Christian country. It seems to me that it is self‑evidently the case that our heritage, our traditions, our architecture, our history, is infused by Christianity. Of course it is and there is nothing remotely controversial in saying so. But of course what flows from those great Christian values is also a wonderful tradition of tolerance, of diversity, of recognition of other peoples, other faiths, other denominations, of our ability to live and work cheek by jowl. Different faiths, different communities, people of all faiths and none, and that is something which seems to me is entirely consistent with our Christian traditions and history and indeed, values that have infused our country for a very, very long period of time. There’s also been a slightly more ugly public debate about some of the work that you do, because I know that many of you work tirelessly in your communities to help those who are less fortunate than others. I know that a number of you, I was just talking to – Helen is it? Yes, about the work you do in a food bank, in North London. Now I have to say to you, in case there is any ambiguity about this, that I don’t think anybody –I don’t think anybody should impugn or question your motives for seeking to do the work that you do voluntarily in your communities for those who need help. And those who deliberately try and distort your motives, I think, need to take a long, hard look in the mirror at their own, their own moral judgements in doing so. You should only be celebrated and praised for the work that you’re doing to help those who are much less fortunate than many of us and who have been going through a particularly difficult time of late. So for those reasons and for so many other reasons, thank you very much for being here. I want to give a particular thanks to all the boys and girls who are from a number of schools I’ve visited recently. You are all clutching these beautifully, intricately made paper baskets which I tried and failed to make myself just earlier, but they’re going to be put to good use, because in a minute we’re all going to all whoosh out to those beautiful gardens out there. I, sort of, sweep my hand proprietarily – this property and garden of course are nothing to do with me; it is entirely at the disposal of you, the public, and the British people – but I’m here just to, if you like, proverbially open the door so we can go out and have an Easter – an Easter egg hunt. So, with that, thank you very much, happy Easter to all of you, and boys and girls, plunder every herbaceous border, rifle through every rhododendron, don’t leave any dandelion untouched. The eggs are waiting for you. Thank you very much. 53% of children don’t know the meaning of Easter, so isn’t an Easter egg about Jesus a good idea? Touchingly hesitant nervous speech which says that all religions are good. He doesn’t happen to have any faith, either in God or elephants but he thinks it’s a jolly good thing! Pic’n’mix religion, that is the current fashion. He, Nick Clegg, believes in nothing. No wonder the country is going to the dogs. There is no fear of God in them, our leaders. Um, hate to be a pedant but it’s still Easter. In fact, it’s Easter week! Oh dear, you’ve exposed my poor grasp of the liturgical year Keith! Thanks for putting this right. 1. This has almost certainly all been about a political party trying to win the Christian vote, all that remains is whether or not Christians believe that the PM’s agenda comes from goodwill. 2. In a way it may matter more whether Miliband and Labour end up ‘doing God’ as well – because the Christian community may soon end up living under Labour. In effect, one of the more important questions is how a Government will treat the Christian community in this country in the future. 3. A Government needs the people to believe that God is with them. That is a hidden part of the agenda here. Claiming an affiliation with God affirms those in power as a legitimate authority in all that they do. Questioning just how much God is really with a Government or not is perhaps one of the most radical things that a Christian can do (beyond following Christ in the first place). 4. As has been noted, political parties who woo Christians also partly alienate other groups. It hasn’t entirely been about winning votes from UKIP for the European elections. The resulting scrum between the atheist letter writers (who were all the usual suspects) and some Christians, could be said to be more about principle than any alignment with the Government position (obviously many Christians do not believe that this is a Christian country anyway). 5. Criticism of the Government after ‘doing God’ has not necessarily been about gay marriage (although it is for some). 6. It’s not cool and never has been for a politician to say they are Christian. It makes us all look bad.